To avoid injury, securely support the vehicle so there is no danger of it falling over. Lift the rear wheel off the ground according to the procedure. Loosen the locknut on each side of the swingarm. Turn the drive chain slack adjusting bolts fully in direction (a) and push the wheel forward. Remove the drive chain from the rear sprocket. 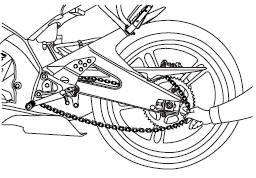 If the drive chain is difficult to remove, remove the wheel axle first, and then lift the wheel upward enough to remove the drive chain from the rear sprocket. The drive chain cannot be disassembled. While supporting the brake caliper bracket, pull the wheel axle out, and then remove the wheel. NOTICE: Do not apply the brake after the wheel has been removed together with the brake disc, otherwise the brake pads will be forced shut. Install the wheel and the brake caliper bracket by inserting the wheel axle from the left-hand side. Make sure that the slot in the brake caliper bracket is fit over the retainer on the swingarm. Make sure that there is enough space between the brake pads before installing the wheel. Install the drive chain onto the rear sprocket. Lower the rear wheel so that it is on the ground, and then put the sidestand down. Tighten the axle nut to the specified torque.